LeAmbition is a whole body rejuvenation. It is a pick-me-up for every part of every system of your body. 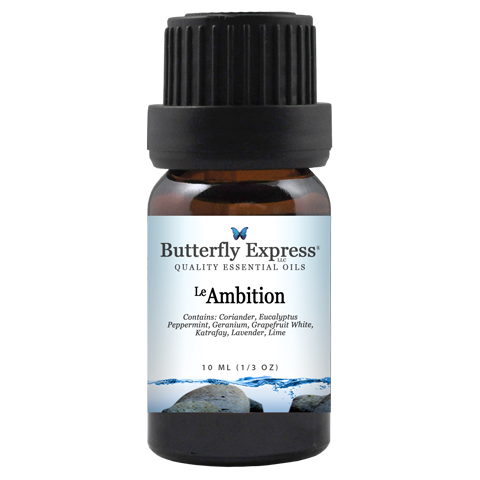 This makes LeAmbition an amazing oil to use when recovering from illness. LeJourney is comprised of essential oils mentioned in the Bible (see Exodus, chapter 30). It is strongly antiviral and is used to expel disease and dead tissue from the body. LeJourney is an immune stimulant and is effective against colds and flu. LeVitality is very specific for the cardiovascular, circulatory, pulmonary, and lymphatic systems. It should be tried for all heart related and circulatory conditions, but LeVitality has amazing uses in so many other areas. Cabreuva essential oil was, in the past, included in European pharmacopeia as a medicine. It can help us find the vision to see solutions to our problems and the inner strength to carry out our plans. Grapefruit detoxifies the lymphatic system makeing it a useful tonic for many body systems. Grapefruit aids with gallstones, water retention, and kidney and liver disorders. Grapefruit, diluted in water, can be used as an astringent face wash for acne. Sometimes called Lavender Tea Tree oil, Rosalina combines the calming, soothing nature of Lavender with the strong antimicrobial properties of Tea Tree. Rosalina is from the same family as Tea Tree but is gentler, sweeter, softer, and has a milder aroma. EMOTIONALl/PHYSICAL ASPECTS: This delightful blend is designed to function on both the physical and emotional planes, even more than is usual for essential oils. LeWeightless increases metabolism, especially fat burning, and helps to dissolve cellulite. It is a lymph drainer and blood purifier and can be helpful with acne. Emotionally it lightens the weight of our own negativity which is so often the trigger for "binge" eating or junk food consumption. LeWeightless is used in programs for eating disorders such as anorexia. PHYSICAL ASPECTS: Rose is one of the very best oils for use in any emotional crisis. It is useful in extreme debility and fatigue. Rose has a four-fold action on nerves, digestion, vascular, and urinary systems. This action is one of cleansing, rather than stimulation. Rose oil, surprisingly, is one of the most antiseptic essential oils. This antiseptic action, combined with its action on capillaries and its soothing and emollient qualities, make it a wonderful oil for nearly all types of skin. Four of the blends contained in LeFortitude are physical healing and pain relieving oils. The fifth blend, LeTranquility, is generally considered an emotional oil but also has some great physical aspects. LeTranquility is one of the best blends to relieve migraine headaches, and is useful for circulatory problems to the extremities. Because LeTranquility has some of the same oils as LeMillenia, it has some ability to realign bones and tissue. The synergy of this blend of blends is absolutely amazing. It is loaded with healing, muscle relaxing, pain relieving, and anti-inflammatory properties, as well as emotional support for the anxiety and stress that often comes along with being hurt or injured. The list of issues this blend can be used for is extensive. It would be beneficial for arthritis, sore or torn muscles, bruising, nerve damage, fibromyalgia, headaches and migraines, osteoporosis, sprains, breaks or other injuries, sciatica, and any other inflammatory or pain related conditions. LeIntensity was created to use the wonderful healing and pain-relieving properties of Hemp essential oil. Hemp and the other oils in this blend are great for pain management, muscle relaxation, re-establishing good blood supply to tissues, reducing inflammation, and promoting healing. This blend is amazing for any kind of physical pain, and for any muscle or connective tissue injury. The Capsicum in this blend makes it especially beneficial for arthritis. "Chiropractor in a bottle" is a good description of this blend except that LeMillenia aligns so much more than just physical structures. LeMillenia aligns the electrical energies of the body, balances every meridian, and energizes every chakra. In addition, LeMillenia maintains the integrity of the connective tissues that wrap, connect, and protect every organ and balances the emotions connected to each organ. LeMillenia balances the moisture and fluid levels in the body. This is one of my favorite bath oils and I am so glad to see it come out as a bath bomb. This tincture is made out of fresh green and red jalapeno peppers. Jalapeno peppers have the same latin name as Cayenne peppers, and the same therapeutic properties. While Cayenne is slightly stronger therapeutically, it is very hot and most people find it unpleasant to take. Mild Cayenne, as the name implies, is much milder heat wise than Cayenne, and is almost as strong therapeutically. It is a great option for anyone who wants the benefits of Cayenne, but does not want to deal with the burn of taking the regular Cayenne tincture. This limited edition Carrier Oil is made with Virgin Grapeseed Oil rather than the refined Grapeseed oil that the regular Carrier Oil is made with. The therapeutic properties of Grapeseed Oil are much stronger in Virgin Grapeseed than in the Refined Grapeseed. While the Refined Grapeseed has almost no odor, Virgin Grapeseed has a vinaigrette like aroma. LaRee Westover has written four books on essential oils, herbal remedies, and homeopathy. She along with the Butterfly Expressions team seek to empower you to take care of yourself and your family through education. These books are available in book format as well as electronically. Did you know that Butterfly Express has over 40 kits, not to mention gift bags and starter collections. Kits for flu and immune building, kits for surviving school, and even kits for labor as well as kits for the new mommy. To top it all off, every kit is on sale in the month of January.